Land in any airport in Kerala and you will be welcomed by the lush green canopy of the coconut trees. So unlike many other places, even outsiders dont face any issue in identifying the origin of the name of this beautiful stretch of land, Kerala; The land of Kera or coconuts. Malayalees are an enterprising class. Contrary to popular perception, it is not that we work hard only outside the state. Such misconceptions arise only because of the inability of others to understand the intricate way in which the Malayalee mind works. The basic thumb rule is as follows: when outside Kerala, the Malayalee works hard; when inside Kerala, he get things to work for him. It was this that led our great grandfathers to discover the potential of the coconut tree and plant them all over Kerala and even name the place as such. It is undoubtedly a wonder tree. Every bit of the tree can be put to good economic use: the nut, the husk, the wood and so on. But the best part is yet to come. You get one of the best form of natural liquor from the coconut tree called kallu. Now I guess you have got a feel of how the Malayalee mind works. The story seems to lead to a happy ending. But there is a twist. 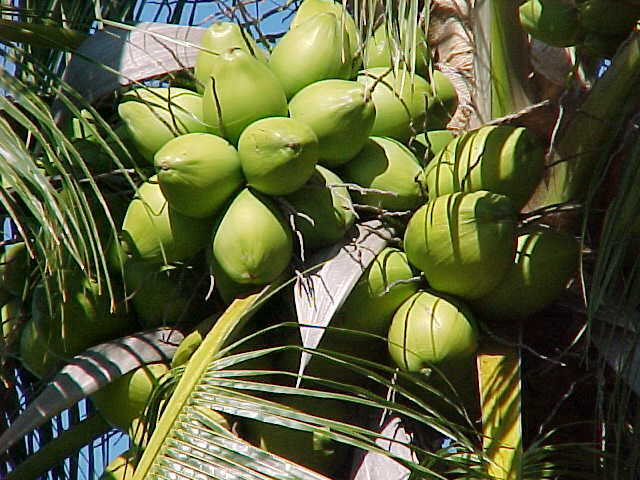 For the benefits that you get from the coconut tree, there is one huge problem. The tree grows upto a height of 30 m on average. The nut weighs around 1.5 kg. A fully grown nut when it falls down will touch the ground at around 80 km/hr velocity. At this speed and weight, dont have any misconception, a falling nut can be your ticket to the other world. As the canopy spreads out, a radial distance of 2 metres from the trunk can be safely classified as ‘High risk zone’ and a further 1 metre can be classified as ‘Potential high risk zone’. So far I have talked only about falling nuts. If your head is fortunate enough to intercept the path of a falling coconut leaf, (this requires a footnote for the uninitiated. A falling leaf brings very pleasant imageries in our minds. But the leaf in question here is a bunch of leaves connected by a truck. It weighs some 10-15 kgs. So a falling coconut leaf is just as good as a falling tree) your loved ones will be spared of the expenses of burial. The safety hazards are so scary that this happened when Barack Obama visited India in 2010. But still we plant it everywhere. Not just in groves and plantations but on front of and behind our houses, in front of commercial complexes and so on. Even when the economic return from the sale of the nut has come crashing down, we keep on planting. The emotional attachment is also playing its part here.To obviate the concerns on the potential risks posed by the tree, our great grandfathers created a proverb also (the intricate malayalee mind at work). ‘Thengu Chathikilla’, The coconut tree will not betray you. So you hear countless stories of how the coconut fell just inches away or the leaf coming crashing down a few seconds after the person left the place etc. But all these beliefs and concern for the tree breaks down the moment your neighbour’s coconut tree mischievously pokes its head into your compound. The infamous hypocrisy of the Malayalee at work? Sociologists need to go deep into this. People start running from pillar to post to get the tree out of his compound. Starting from the panchayat to invoking the provisions under section 133 of CrPC, some even go upto the High court filing a writ petition. This is independent of the number of coconut tree present in his own compound. Risk to kids playing in the compound, damage to the roof tiling…The arguments and counter arguments just dont end. This is disservice to our great grandfathers who discovered a tree as great as this and even went to the extent of finding a proverb to displace possible fears. not be surprised if you find the state named as ‘Rubberum’ some 100 years from now. It is just the Malayalee mind at its best. A career in the Indian civil services is still one of the most coveted job in the nation. The number of applicants for the 900 odd posts every year is increasing exponentially. Just about 6 lakh applied for the 965 notified vacancies for CSE 2010. After a one year gruelling process, the UPSC recommended 920 for appointment. Of which only those who end up in the first 100 will get the coveted IAS/IFS and the remaining may end up appearing for at least one more attempt!! And even after getting through, you work under severe constraints. IAS and IPS officers works directly under the supervision of elected representatives. Their decisions are to be guided by political sensibilities as well as real-time requirements. Added to all this, there is no fixed tenure at any of the posts. The not so favoured among the officers may end up getting 3 or 4 transfers every year. So one should be very sure about the requirements of this examination and well as the requirements of this service before deciding . Given the competitiveness of exam, there is no other way other than full-time preparation. One need to start 7-8 months before the prelims and the exam process takes one whole year. Thus atleast two years need to be completely devoted towards the preparation. While we hear about the inspirational stories of the toppers and the successful civil servants, what is lost out in the noise is the failure of tens of thousands of aspirants and the intense dissatisfaction with which many officers continue in service. Know about the services. Talk to serving and retired bureaucrats. Read memoirs or articles. There is more to the services than Lal bathi and huge bungalows. Be sure that you will fit into the service. Know about the requirements of the exam. Make a realistic assessment of the efforts that need to be put in. People don’t start as equals as far as this exam is considered. People with a good general knowledge base, opinions and ability to express their views definitely stand at an advantage over others. Make a rational self assessment. Dont do it based on your past laurels and achievements as this exam is not testing intelligence as defined in the conventional sense. Its looking for broad-based individuals with opinions. Thus be very sure before taking the plunge. But once you have made the choice, there should be no looking back. You will face failure, pass through highly depressing stages, doubt your ability to make through, may have to start from square one after reaching upto the last stage….Thus is it a test of your mental strengths as much as it is of your intellectual abilities. The whole process of preparation and exam is a life changing one, whether you come out successful or unsuccessful. You get to read and learn about things that you would not have done otherwise. There is nothing other than knowledge that makes you feel more humble by the virtue of having more. I feel much more closer to my family, my close relatives and my friends than ever before. Think and discuss before starting. All the best for the aspirants. @Aspirants.I will be writing about my experiences and strategies for each of the subjects in this page. Please refrain from sending me messages and friend requests in facebook. I think it is not the right platform and I also prefer to keep it personal. Please follow this blog and post comments if you want to clear any doubts. As someone who found it hard to get proper guidance in the beginning, I am only happy to help. But please use this blog as the platform. Rep: We would like to take your interview for our xyz magazine. Me : Ok. But i cannot endorse your magazine as i havent used it. Rep : Thats ok. Its a questionnaire. Plus we are also giving you a cash award for your achievement( I later got to know from another source that the amount works out to be 5000 rupees). Why the hell should they give me a cash award?? Every year people top the exam. I havent even used their magazine. The catch is in the questionnaire that we are asked to fill. “Apart from our magazine …… what else did you read?”, “How long have you been reading xyz magazine” were some of the questions to name a few. They also change some of our answers to suit their ends too. In the end, the interview would turn out to be an open endorsement of the magazine by us and the so called ‘cash award’ a payment for that!! Thanks to Supreet singh IAS who had blogged about this here, i could call their bluff. Still i couldnt give him a firm ‘No’ when he called and said “I will call back in an hour”. I called back some 20 minutes later and said I would neither endorse their magazine by appearing in the interview nor accept any monetary reward from them. He has rightly titled the post as ‘…Warning to the future toppers…’ But many in the rank list may be either too naive to know or may find it ok due to the prospect of reaching out and inspiring more people. By the time it is discovered that the interviews have been distorted and we have been made to endorse their product, it will be too late. And also the ‘cash award’ will ensure that they dont create any problems afterwards. It seems the training for being an upright civil servant begins even before you reach Mussourie. Firm ‘No’s’ to such invitations, felicitation events organised by shady individuals is only the beginning of a very long journey.